Last Sunday I had the pleasure of spending a few hours with Agata and Chris to capture their intimate wedding ceremony at the Union Bank Inn in downtown Edmonton. Theirs was an intimate ceremony that included a sand ceremony to symbolize the joining together of their two lives. Initially we had planned to head down into Edmonton’s river valley to do their formal photographs but once again, Mother Nature decided to deliver some ugly weather in the form of wind and rain. Since I’ve had a lot of experience with bad weather this summer, I was prepared with a plan B.Â We headed down the street to Commerce Place and took advantage of the the beautiful lines and modern interior combined with great natural light coming in from the glass ceiling. 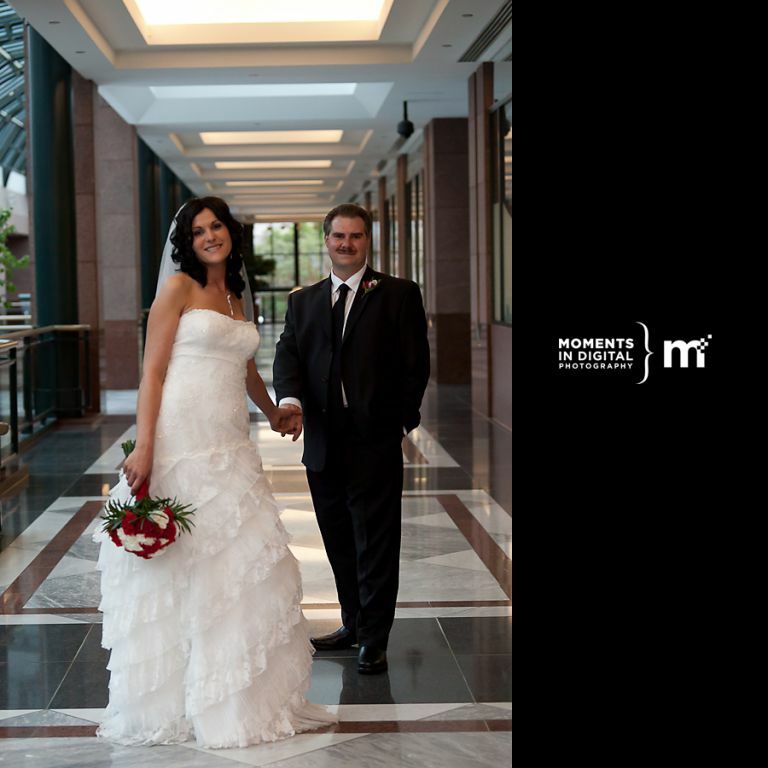 If you are planning your wedding, one thing to discuss with your photographer is where you want to go for your photos. He or she may have some great places in mind based upon their photographic style but don’t be afraid to speak up and let them know what you like. For example, some photographers love to shoot in urban environments but if that isn’t your preference, you may not wind up liking your photographs if you don’t tell them beforehand. Having that conversation ahead of time is important so you don’t run into that situation. As photographers, we won’t be offended if you tell us that you don’t like a particular location but do keep in mind that we want what’s best for you so if we do make suggestions with respect to the best times to shoot and great locations, try to keep an open mind and know that we’re working to make you look your best and a big part of that is location and good lighting. That being said, it’s also important to think about a backup indoor location where you can go in the event the weather turns sour on your wedding day. One advantage of the ceremony being held on a Sunday was that Commerce Place was a ghost town. That provided us the luxury of being able to shoot just about anywhere without having to worry about other people in our backgrounds. Agata and Chris were a lot of fun to work with and their wedding party did a great job too. Here are a few photographs from their wedding day.